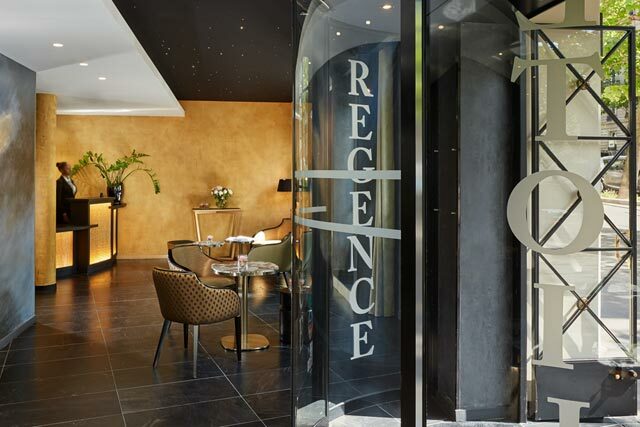 Welcome to the Régence Etoile 4-star hotel, an elegant and ideally located starting point for your visit to Paris, the City of Light. Our hotel was recently renovated by the Parisian architect Jacques Mechali. It has 40 rooms, including 2 studios and 2 rooms adapted to people with reduced mobility. Pure and elegant designs, simple and restful colours, a comfortable and friendly environment, combining the charm of 19th century Haussmann buildings and the modern convenience of new technology. You will be our guest at a hotel where the sense of service is a real art! Our spacious reception is accessible 24 hours a day and opens onto a lobby featuring a Grace sculpted by René-Albert Baucour. You will enjoy an attentive welcome in English, Spanish or French from our multilingual team. Our experienced reception team, Morgan, Cecile, Sylvie and Marjorie will help you with tips for exploring the sights in this richly historical district.